It seems as long as South Carolina exists, Florida will have a state to point to and say "at least we're not them." See, a while back, the Florida legislature toyed with the idea of a license plate that had a big cross on it, along with the words "I Believe," sort of like the one below. See the difference? The one above says "South Carolina," and their legislature mocks ours for its lack of faith and willingness to fight lawsuits. 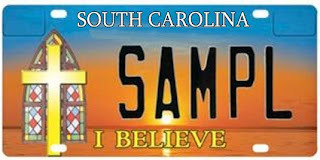 South Carolina's lieutenant governor announced Thursday that he is willing to put up $4,000 of his own money so his state can become the first in the nation to issue "I Believe" license plates with the image of a cross and a stained glass window. The legislation allowing the plates was one of several religious-themed bills to became laws in the closing days of the state's legislative session. But just in case the license plate move isn't enough to cement South Carolina's place atop the world-o-wingnuts, they also passed this little gem. The bills mean South Carolinians attending local government meetings could soon see the Ten Commandments and the Lord's Prayer posted on walls, pray without fear of being sued and drive home in cars with the "I Believe" plates. Oh yeah. That's the good stuff. Suddenly I'm feeling a little better about being a Floridian. Yeah, we've got crazy tax cuts and a horrible economy and a governor trying hard to convince the McCain campaign that he's believably straight so as to make it on the national ticket, but at least our legislature beat back the "I Believe" license plate and hasn't, to my knowledge, even considered a law that would show how to pray properly in public meetings. I thank you, South Carolina, for restoring some of my state pride. And now the Random Ten--put the iTunes on party shuffle and post the next ten songs to pop up. No cheating to look ironic--yes, Journey's new album debuted at number 5, but there's still no excuse for having "Wheels In the Sky" on heavy rotation. Here we go.